Sir Norman Brearley was an aviator and pioneer of commercial air transport in Australia. Born in Geelong, Victoria in 1890, he moved to Western Australia in 1906. He joined the Royal Flying Corps at the outbreak of World War I and was wounded in France. Returning to Western Australia he set up West Australian Airways Ltd in 1921 which in 1936 became part of Australian National Airways. The 1921 licence is the first pilot's licence issued for civil purposes in Australia under the 1921 Air Navigation Regulations, even though it is licence number 2. 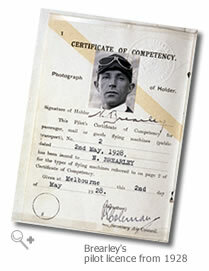 Licence number 1 was not issued until 1930, when it was presented to famed aviator Amy Johnson to mark her historic flight from London to Australia. Brearley opened the Perth Flying School at Maylands, Perth in 1927 and retired from commercial aviation in the 1930s. After serving with the RAAF in World War II Brearley was later knighted in 1971. He died on 9 June 1989.